Limited launch in May-July. No receiver! – smartphone-only display on Apple iOS devices. 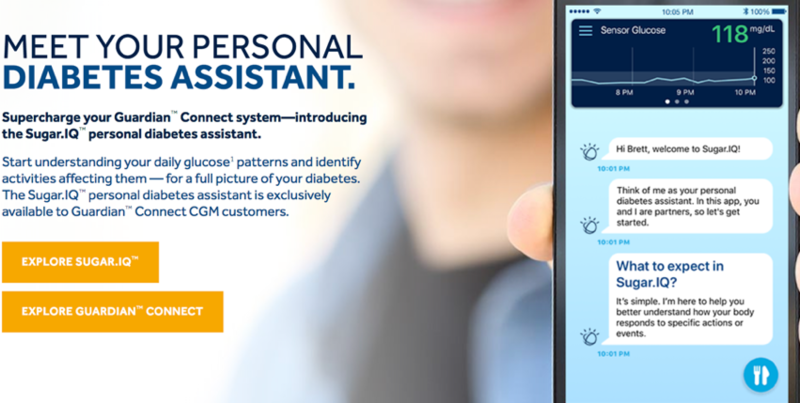 Plus, the new “personal diabetes assistant,” Sugar.IQ with Watson. 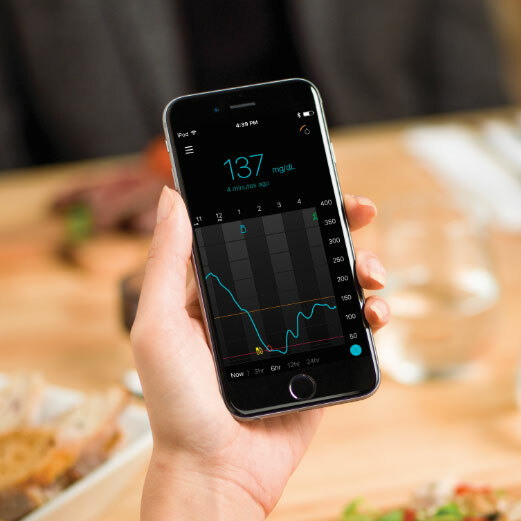 Medtronic recently announced FDA approval of its Guardian Connect mobile Continuous Glucose Monitor (CGM), along with the paired Guardian Connect App for Apple iOS devices. A limited US launch is expected between May-July 2018, with wider availability in August-October. Guardian Connect is Medtronic’s “standalone,” real-time, mobile CGM in the US, meaning it does not send data to a paired pump – real-time CGM information goes straight to a smartphone app, similar to Dexcom’s G5. One of the biggest news items in this approval is what it doesn’t include: a dedicated receiver. Guardian Connect will be the first CGM to launch in the US where smartphone display is the only option for viewing data. By eliminating any receiver, Guardian Connect should hopefully reduce the upfront cost of getting on the CGM. Plus, it means all users’ data will be sent to the web-based CareLink where users can view CGM data online, reducing gaps in data and making it easier for users to coordinate their diabetes management with their healthcare providers. Medtronic’s new mobile CGM is approved for 14-75 year-olds, includes the more accurate Guardian Sensor 3 (same as in the MiniMed 670G hybrid closed loop), and is approved for both arm and abdomen wear up to seven days. It has a two-hour warmup and requires two fingerstick calibrations per day, with “occasional” diagnostic calibrations required. The accuracy is close to Dexcom’s G5 and Abbott’s FreeStyle Libre, with an average error around 9%-11% (arm-wear is more accurate). In long awaited news, Guardian Connect will also launch with exclusive access to the long-awaited “personal diabetes assistant” app, Sugar.IQ, powered by IBM Watson’s cognitive computing technology. As we’ve covered previously, Sugar.IQ will identify unique patterns and insights from CGM, insulin, and food data – see some cool examples below. At launch, Sugar.IQ will only be available to Guardian Connect users, though hopefully it will expand over time to other Medtronic users. Sugar.IQ is a separate app that runs alongside the Guardian Connect app, meaning users will need to operate two apps to get the full functionality. Another new feature with Guardian Connect are alerts for predicted high and low blood sugars 10-60 minutes in advance. These alerts pop up on the user’s smartphone (or Apple Watch) as notifications, just like text messages. For alerts that happen 60 minutes in advance, we’ll be interested to hear how accurate and helpful they are in real-world use – glucose values can be difficult to predict that far in advance. Guardian Connect includes remote monitoring alerts for loved ones via text messages and a web app that can be accessed from any internet-connected device. For instance, a parent could view their child’s CGM data and receive alerts for low and high blood sugars in real-time. Even though the MiniMed 670G uses the same sensor as the Guardian Connect, the 670G pump does not have Bluetooth, meaning it can’t share information with a phone at this time. This also means that remote monitoring is still not available for the 670G. Medtronic is working on adding Bluetooth to the 670G pump, but has not shared when this will happen. Medtronic is also working on compatibility for Android devices and a pediatric indication, but could not comment on availability. Guardian Connect has been available outside the US since fall 2016, with very positive feedback thus far. We’re glad to see people with diabetes in the US will now have another mobile CGM to choose from. Users can also “follow” certain foods, allowing them to see their typical glucose response to common meals, restaurant orders, etc. By helping users see glucose and lifestyle patterns like this, Sugar.IQ can help people adjust their daily habits and diabetes care management to spend more time in range. An early study of Sugar.IQ presented last fall found a small improvement in time-in-range with use of the app (+33 minutes per day). The Sugar.IQ and Guardian Connect apps communicate in the background (via the CareLink cloud), with only minimal delay between them. 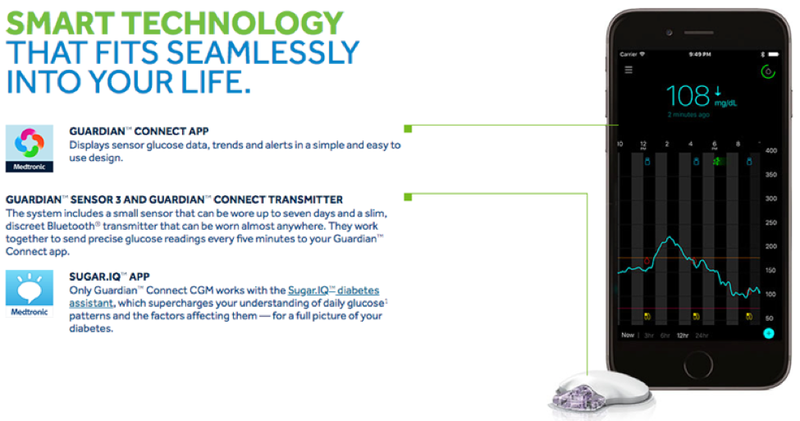 Sugar.IQ cannot receive CGM data directly from the Guardian Connect transmitter, meaning both apps need to be used – Guardian Connect to view real-time CGM data and Sugar.IQ to get patterns and insights. Guardian Connect will also come with predictive alerts that notify users 10-60 minutes before high or low blood sugars are expected, allowing users to take preventative action. Medtronic says that the system’s alerts are accurate for predicting over 96% of low blood sugars less than 70 mg/dl – this assumes the alert comes within the 15-minute period before or after the low, a fairly wide window. These alerts are more predictive and come further in advance of Dexcom’s G5, which only notifies users when the low- or high-threshold is crossed. Of course, there is also a potential nuisance factor, especially if these predictive alerts come too often. Fortunately, users can turn them off if they are not helpful. What are Guardian Connect’s strengths and areas for improvement? We have not worn Guardian Connect, so the below is only based what we’ve learned from the company.